What Do We Do With Our Walkers? enjoy a quick run through the snow on a warm March day. Family Trees and Living Off-Shoots: Hunter’s Allen F-10, in this issue. 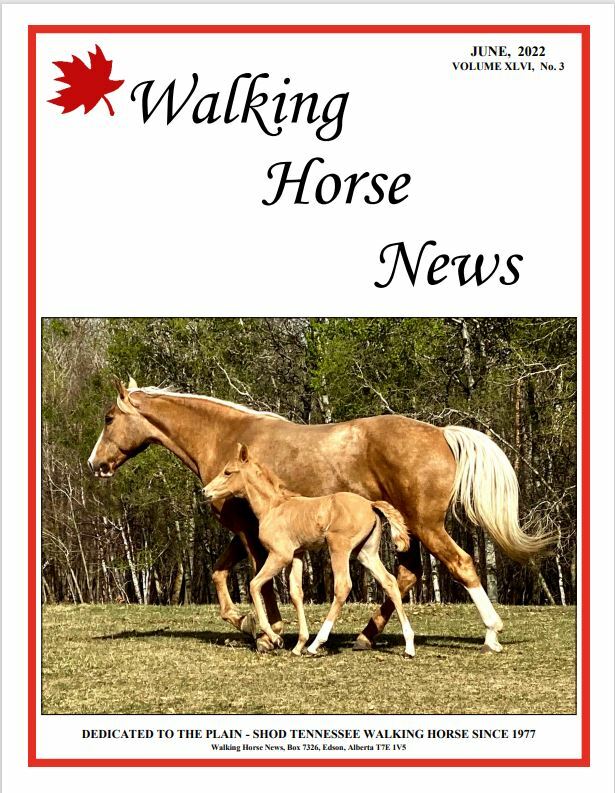 Walking Horse News is an independent magazine published BIMONTHLY in Edson, Alberta since 1977. Dedicated to the plain shod Tennessee Walking Horse in Canada, WHN features stallions at stud, classified ads of horses for sale, breeders' ads for walking horses, as well as stories of Walkers and their owners, training and health articles, photos, and history of the breed. Subscribe now! Canadian subscriptions are $24. SEND SUBSCRIPTIONS to WALKING HORSE NEWS, Box 7326, Edson, AB T7E 1V5. SUBSCRIPTIONS TO THE UNITED STATES are $32 in US dollars, with cheque made out to Marjorie Lacy. Email version available for $10/year in Canada & USA. Interac payments available within Canada.